HARARE, Zimbabwe (CNN) -- Zimbabwe's central bank says it will soon introduce a 100 trillion dollar note as the once prosperous country battles to keep pace with hyperinflation that has caused many to abandon the country's currency. 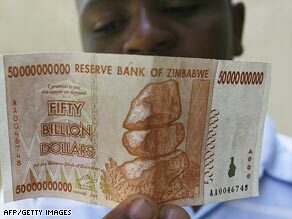 A boy examines the new $50 billion dollar note issued by Zimbabwe's central bank on January 13, 2009. The Reserve Bank of Zimbabwe said the new notes that includes 50 trillion, 20 trillion and 10 trillion would be released for the "convenience of the public," according to statement released Thursday. "In a move meant to ensure that the public has access to their money from banks, the Reserve Bank of Zimbabwe has introduced a new family of bank notes which will gradually come into circulation, starting with the 10 trillion Zimbabwe dollar," the bank said in its announcement. The new 100 trillion dollar bill would be worth about $300 in U.S. currency. A loaf of bread in Zimbabwe now costs about 300 billion Zimbabwean dollars -- and like most commodities, the price increases every day. Earlier this month, Zimbabwe introduced a 50 billion dollar bill as the country battles to fight cash shortages stemming from the world's highest inflation rate. The official rate was 231 million percent as of July. The currency is in free fall, forcing traders to peg their prices to international currency to hedge against losses. The Zimbabwean dollar is facing extinction, with most traders now accepting other countries' notes, claiming that they import their products. Even vegetable vendors prefer the U.S. dollar, South African rand or Botswanan pula, and most workers now demand their salaries in foreign currency. Doctors and nurses have been on strike since last September, demanding salaries in U.S. dollars. The strike coincided with a cholera epidemic that now has claimed more than 2,000 lives. Last week, the state media reported that most teachers had left their jobs. As a result, the end-of-year examinations taken in November are yet to be graded after the markers demanded their wages in foreign currency. Schools are yet to re-open this year awaiting the examination results.